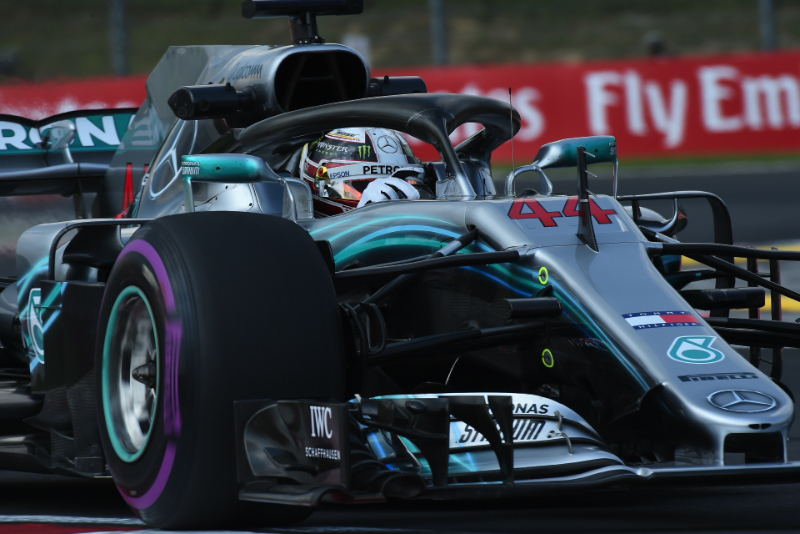 In a race that Mercedes didn’t expect to be strong, Lewis Hamilton led the way winning the Hungarian Grand Prix today. Sebastian Vettel finished second, 17.1 second behind in his Ferrari, followed by him team mate Kimi Raikkonen in third, 20.1 seconds behind the winner. The win is Hamilton’s fifth win of the season and sixth win in Hungarty in his career, and 67th career victory. Hamilton extends his lead in the drivers championship leading into the summer break to 24 points ahead of Vettel. Daniel Ricciardo (46.4s) made a strong run to finish fourth in his Red Bull-Renault, followed by a limping Valtteri Bottas (50.0s) in the second Mercedes finished fifth, Pierre Gasly (73.2s) in the Toro Rosso-Honda was sixth, Kevin Magnussen (1 lap) in the Haas-Ferrari was seventh, Fernando Alonso, on his 37th birthday, in the McLaren-Renault was eighth, Carlos Sainz in the Renault was ninth, and Romain Grosjean in the second Haas was in the final points position in tenth place. The weather was hot leading up to the start with no rain expected today, and drivers are wondering if the tyres will blister in these conditions, and most drivers will try to save the tyres to make only a one stop strategy during the race. In the wet qualifying session yesterday, Hamilton will start from pole with his team mate Bottas alongside on the front row, the Ferrari’s of Raikkonen and Vettel on row two, Sainz and Gasly on row three, Verstappen and Hartley on row four, and the Haas' of Magnussen and Grosjean rounding out the top ten. Alonso in 11th, and Ricciardo in 12th. Stroll starts from the pitlane. After the top ten many drivers starting on soft tyres. Stroll starting on medium tyres. At the appointed time the grid cleared and the drivers made the formation lap, the lights went off and the race started with Hamilton takes the lead from Bottas and Raikkonen. Vettel takes third from Raikkonen. Hulkenberg makes a good start and challenges Hartley in ninth. Ricciardo had some contact on his left-front tyre with Ericsson and runs 16th. At the end of lap 1 Leclerc makes contact with a Force India is out, pulled over to the side of the track. On lap 4 Hamilton leads Bottas by 3.4 seconds. Ricciardo tries to pass Vandoorne for 13th, but can’t make it stick. But then takes the position the next lap. On lap 7 Verstappen slows with an apparant engine issue, and pulls to the side of the track, and the Virtual safety car is deployed. The race resumes Ricciardo battling with Alonso for 11th place. On lap 8 Ricciardo takes Alonso into turn one. At lap 10 Hamilton leads Bottas by 4.4 seconds, followed by Vettel (6.6s), Raikkonen (8.3s), Gasly (17.4s), Magnussen (24.3s), Sainz (28.3s), Hartley (29.3s), Hulkenberg (31.8s) and Grosjean in tenth place. On lap 11 Ricciardo passes Grosjean for tenth place. Ferrari informs Raikkonen that they did not conect his drinks bottle, it will be a long race for the Finn. On lap 12 Ricciardo passes Hulkenberg for ninth lace. Hamilton’s lead is out to 6.1 seconds ahead of Bottas. On lap 13 Ricciardo passes Hartley for eighth. On lap 14 Hamilton sets fast lap at 1m22.783s. On lap 15 Raikkonen makes an early stop from third place, and switches to soft tyres and rejoins in sixth. The next lap Bottas pits and switches to soft tyres and rejoins ahead of Raikkonen in fourth. Hamilton sets another fast lap at 1m22.539s. Ricciardo passes Sainz for seventh place. On lap 16 Hamilton leads Vettel by 8.8 seconds. Ricciardo sets fast lap at 1m22.397s. Raikkonen passes Magnussen for fifth, and sets fast lap at 1m22.046s. At lap 20 Hamilton leads Vettel by 8.4 seconds, followed by Bottas (26.7s), Gasly (31.3s), Raikkonen (32.1s), Magnussen (41.1s), Ricciardo (41.8s), Sainz (49.5s), Hartley (52.5s) and Hulkenberg (54.0s) in tenth place. On lap 21 Ricciardo passes Magnussen on the outside into turn 2 for sixth place. Ferrari reports to Vettel that the are now on “plan C”. On lap 23 Hulkenberg pits and switches to medium tyres and rejoins in 14th. Hartley pits and switches to medium tyres and rejoins in 13th. On lap 25 leader Hamilton pits and switches to soft tyres, and rejoins in second, ahead of Bottas - Vettel takes over the lead and is yet to pit on his soft tyres. Ricciardo is closing on Gasly, and passes him for fifth place. On lap 27 Hamilton sets fast lap at 1m21.968s. At lap 30 Vettel leads Hamilton by 14.0 seconds, followed by Bottas (22.9s), Raikkonen (24.8s), Ricciardo (31.2s), Gasly (38.3s), Magnussen (47.9s), Alonso (61.4s), Vandoorne (65.1s) and Ocon (74.0s) in tenth place. Grosjean pits and switches to soft tyres, and rejoins in 12th. Raikkonen closes to just over a second behind Bottas in third. Perez passes Stroll for 16th. On lap 32 Magnussen pits for soft tyres and rejoins in ninth. The next lap Gasly pits for soft tyres and rejoins still in sixth place. On lap 37 Hamilton has closed the gap to Vettel to 9.8 seconds. On lap 38 Bottas sets fast lap at 1m21.842s. Raikkonen pits from fourth for soft tyres and rejoins in fifth. On lap 39 Vettel pits from the lead, has a slightly slow stop for ultrasoft tyres, and rejoins in third place behind Bottas. Alonso pits for medium tyres and rejoins in ninth, Ocon pits for soft tyres and rejoins in 15th. On lap 40 Raikkonen sets fast lap at 1m21.405s, and then again at 1m21.381s. Vettel closes on Bottas in third on his fresh tyres. Ricciardo in fourth is still yet to pit on his soft tyres. On lap 43 Raikkonen sets another fast lap at 1m21,135s and follows 7.2s behind Ricciardo. On lap 45 Ricciardo finally pits for ultrasoft tyres and rejoins in fifth place. Ferrari tells Vettel that Bottas is running to the end, and that he will need to pass him on the track. On lap 47 Ricciardo sets fast lap at 1m20.012s. On lap 49 Stroll is the last to pit for ultrasoft tyres, and runs last in 18th, two laps behind. Vettel closes to 1.2s behind Bottas. Vandoorne pulls off the track with a gearbox failure from ninth place, the virtual safety car is out for a lap. At lap 51 Hamilton leads Bottas by 12.0 seconds, followed by Vettel (13.9s), Raikkonen (23.5s), Ricciardo (37.6s), Gasly (64.0s), Magnussen (71.8s), Alonso (1 lap), Sainz and Grosjean in tenth place. Vettel closes to under a second behind Bottas in second place. Hulkenberg passes Perez for 13th place. Bottas complains that his rear tyres are starting to struggle. Raikkonen closes to 3 seconds behind Vettel. At lap 60, with 10 lap to go, Hamilton leads Bottas by 17.4 seconds, followed by Vettel (18.4s), Raikkonen (19.4s), Ricciardo (37.9s), Gasly (70.8s), Magnussen (77.1s), Alonso (1 lap), Sainz and Grosjean in tenth place. Raikkonen has closed right behind his Ferrari team mate. On lap 65 Vettel powers past Bottas for second at turn two, Vettel chops him and the two touch, and Bottas damages his front wing. The Ferraris get by, Bottas running two seconds a lap slower continues in fourth. Ricciardo closes on Bottas and the two battle. Ricciardo tries to pass on the outside of turn 1, and the two touch, Ricciardo continues but has damage to his Red Bull. On lap 69 Ricciardo continues to chase Bottas, and Mercedes tell Bottas to give the position back to Ricciardo. On lap 70 Bottas lets Ricciardo past. Hamilton wins, ahead of Vettel and Raikkonen.